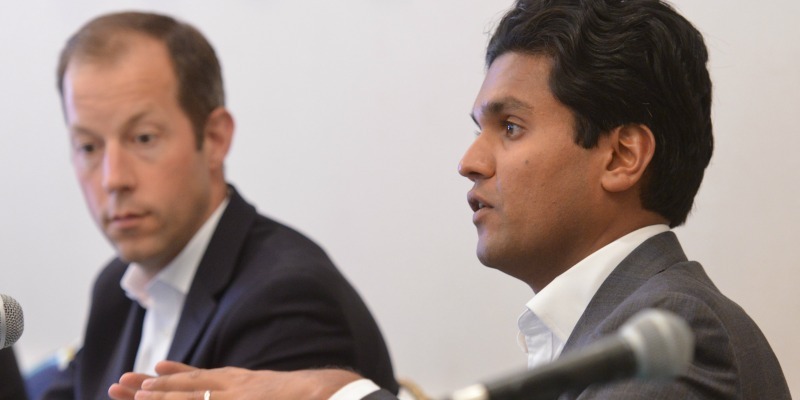 Christopher S. Kiper, Managing Director of Legion Partners Asset Management LLC, and Vikas Garg, Portfolio Manager, CALPERS, speak at the 2014 Private Fund Conference sponsored by the Lowell Milken Institute. • a full calendar of timely conferences and events that advance solutions to some of the nation’s most pressing challenges. The Institute is driving the agenda for research and policy reform through targeted initiatives that tackle urgent problems in Business Law and Policy. These initiatives result in conferences that bring leading figures to the campus and in publications that reach academics, legal practitioners, the business community and policy-makers. Moreover, consistent with a spirit of collaboration and cooperation, the Institute regularly partners with others to enhance the impact of its work. One example is the annual NYU-UCLA Tax Policy Conference that rotates between Los Angeles and New York, reaching two key hubs of business and legal activity. The Institute supports the Program on In-House Counsel providing research and resources to the academic community on the changing role of in-house counsel through the publication of the In-House Counsel Scholarship Database. The database is a comprehensive list of significant academic articles addressing the role of in-house counsel. The Institute publicizes the results of its research through various outlets, including its own white papers. In addition, the proceedings of the annual Tax Policy Conference are published in the prestigious Tax Law Review.